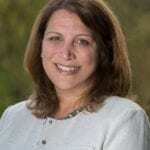 Home » Blog » Family Vacations » Top Family Vacation Destinations : Caribbean » After the Hurricanes – Which Caribbean Island Is Best for Your Family? The hurricanes that ripped through the Caribbean this fall devastated some of the islands, but not all of them. Actually, the majority of Caribbean islands remain open (and anxious) for business during the upcoming winter travel season. So which Caribbean island is best for your family’s winter vacation? Which Caribbean Islands Can You Visit Now? The hurricanes hit some popular Caribbean winter destinations hard. Places like Puerto Rico, and the U.S. and British Virgin Islands are not ready for tourists yet, and still have long roads to recovery. But most other islands survived the storms and are ready to welcome families this winter. For the most up-to-date information on each island, check caribbeantravelupdate.com. Which Island Is Right for Your Family? So now that you see how many choices you have, the question becomes, which island is best for your family? I get asked this question a lot by traveling parents. My answer is always, “it depends.” Because it does. Every family likes different things. My family doesn’t like giant resorts or kids clubs, but I know families who love them. It’s really about what you want to do. Just rotate between the beach and pool? Explore a culture? Hike? Do you want to be in a private place, or a party place? There really is a lot of variety in the Caribbean. And at least one island (and probably several) will be a good fit for your family. I haven’t been to every island, but I’ve gotten around. So I feel like I can speak with some authority. While not every Caribbean island is included in this list – and I’m not mentioning islands that are still hurricane battered – I hope it will help with your decision making. A mid-sized all-inclusive, it includes a new water park, no competition for pool chairs or restaurant reservations, very nice staff, and an adjacent farm with horses that the kids can brush and ride, nighttime laser tag, a teen room with Xbox, and a decent beach (we stood in waist-high water and fed the fish each morning). It’s in an isolated town, and not super fancy, but it’s comfortable, clean and well worth the money. 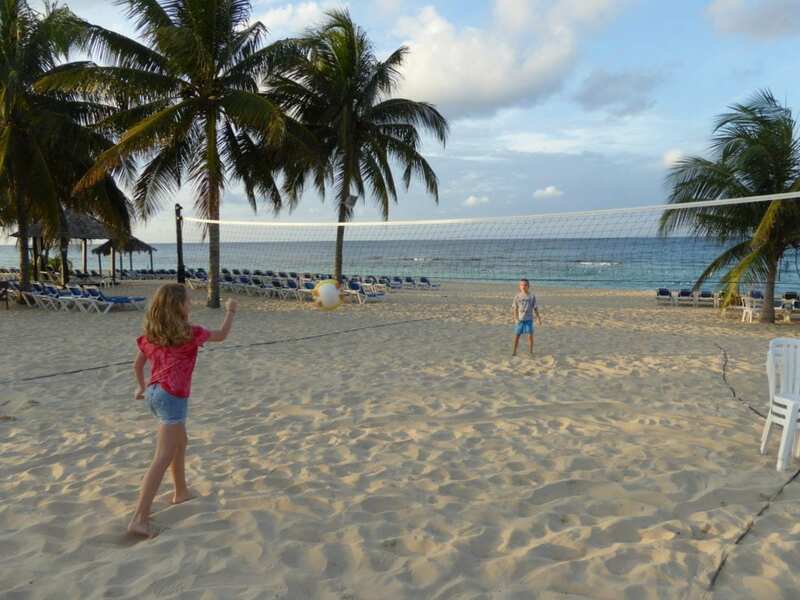 Playing beach volleyball at Jewel Runaway Bay Resort in Jamaica. While parts of Aruba have a wild spring break party vibe, we found a good balance (and good value) at the Aruba Marriott (Read my story about Aruba here). It’s one of those resorts where you don’t need to leave, because everything you need is on-site, although it feels more American than Aruban. Also, I’ve been heard raves about Aruba’s Phillips Animal Garden, a zoo that’s great for younger children. I routinely see great deals to all-inclusives at these places at Costco Travel, TravelZoo.com, and Booking.com. The creme de la creme of all-inclusives for families are the Beaches Resorts in Jamaica and Turks & Caicos. While pricey, the family activities they offer (a DJ scratch class!) are amazing. 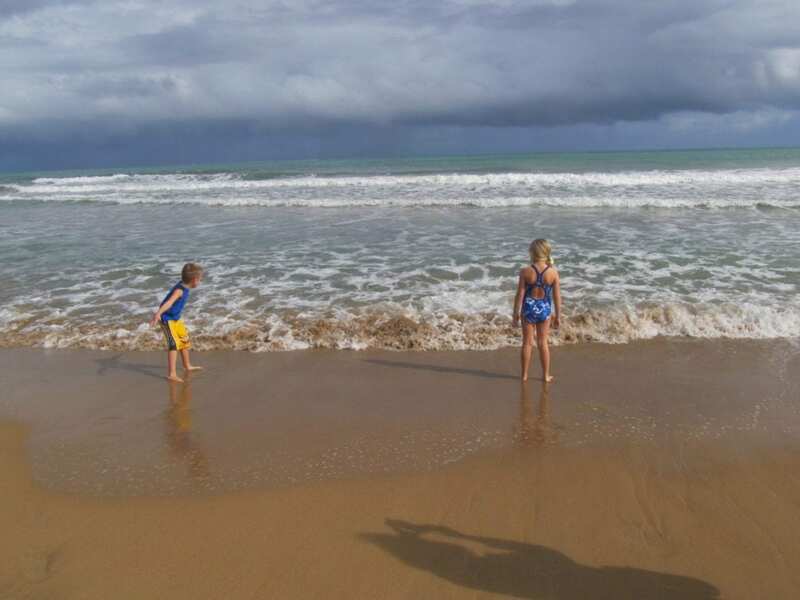 Cosmopolitan TravelingMom gave a great rundown of what the resort offers, and what are worthwhile add-ons. When I’m on vacation, I don’t want to be with crowds. I don’t want to be near ports where massive cruise ships dock. I want to feel like I’m away. In St. Kitts, you’ll find a friendly, unique island with a UNESCO World Heritage site, a train that circles the island, batike fabric makers, gorgeous beaches and more. I can’t say enough good things about Ottley’s Plantation Inn, a property that’s not on the beach, but has a really warm, homey feel (plus an awesome restaurant). My review of the hotel is here, and my list of family-friendly things to do in St. Kitts is here. St. Lucia was untouched by the recent hurricanes, so its rainforest hikes with waterfalls, volcanic beaches, and uncrowded beaches await. 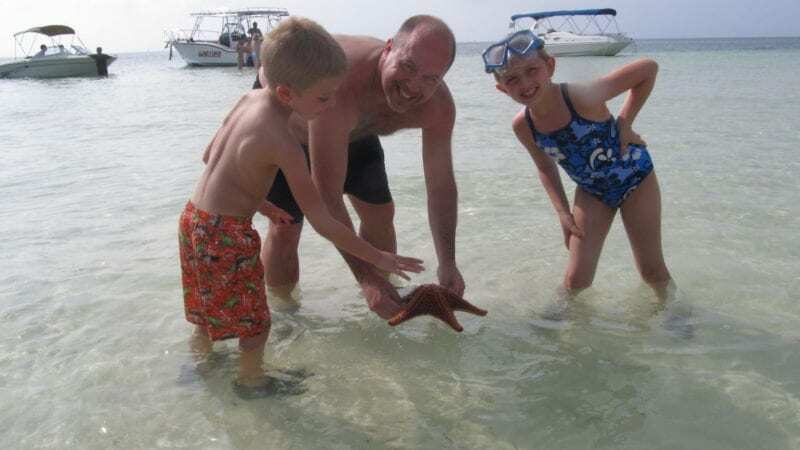 Grand Cayman is one of my family’s favorite Caribbean Islands. Seven Mile Beach is clear blue water and white sand as far as you can see. It’s all public property, so you can walk up and down it all day and look at the resorts, pick up shells, or stop to snorkel. We stayed at the Westin Casuarina, which is a large resort with all the creature comforts we needed, and we had a nice stay. When we needed a break, we drove to the other end of the island and visited Starfish Point, where you see live starfish in the water. Don’t miss Stingray City (it’ll be your favorite photo op), and our favorite, the Turtle Farm, where we got to hold and feed turtles of all sizes. My story on Grand Cayman is here. 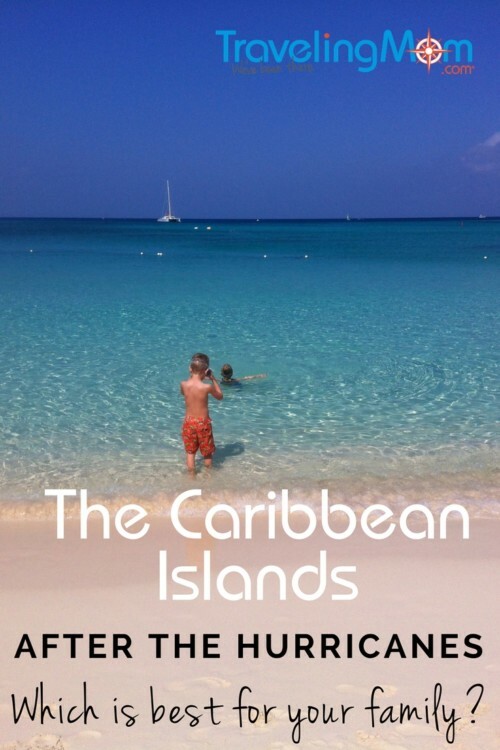 TravelingMom tip: One important note about beaches in the Caribbean. Make sure to check that your beach is a soft sand beach and not a rock beach. Rocky beaches are not kid friendly! Watching the sunset on Grand Cayman Island. St. Vincent was recently described as the place billionaires go to get away from the millionaires. But if you’re more in the $800/night range, there are a lot of really nice places in the Caribbean for you. 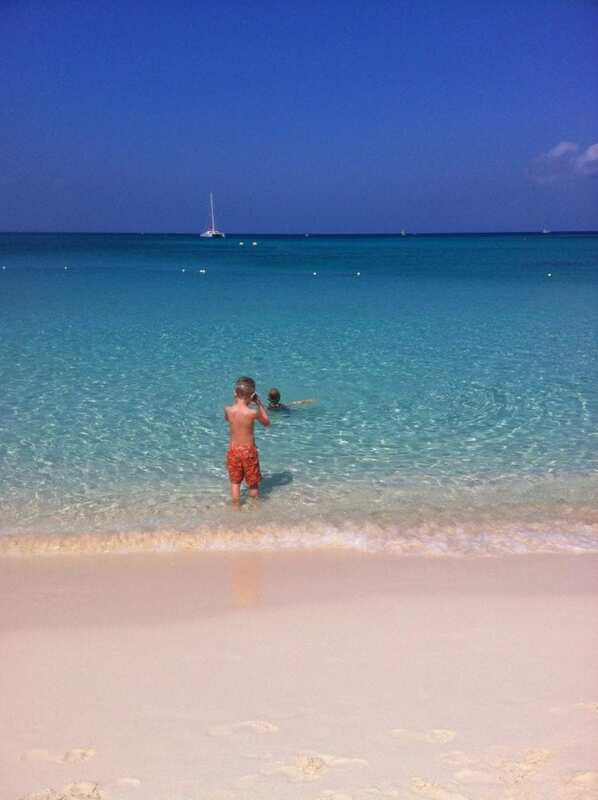 The most kid friendly is Turks & Caicos, and many TravelingMoms have excellent suggestions for resorts and activities. If you have any questions about any of the places, post your question via our Ask a TravelingMom feature and we will rally the Traveling Mom writers to give you our honest mom-to-mom advice. Clarity is so appreciated; this is helpful. Must confess how sad I feel about St. Croix—-a much loved by me island. Hurricane recovery will happen.